Happy February 1st! Can you believe it? It’s already February. So crazy! This month is ALL about love. Whether you are single, married, besties, in love or just learning to love yourself (which is VERY important must I add), Valentine’s Day gifts can be super fun to give AND to receive. 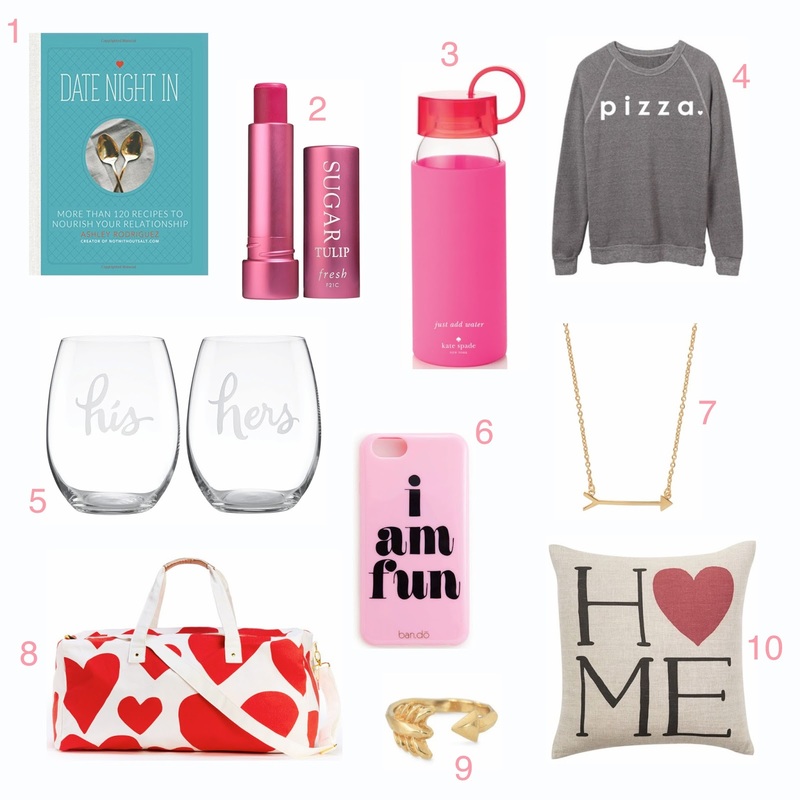 Here is a little Valentine’s Day gift guide focused more towards the girls, ladies or besties in your life! 1. Date Night In – How cute is this book?! Don’t get me wrong, I love date nights out but I also love a good date night in. Cooking a new recipe and opening a bottle of good wine with my hubby is a perfect night in my book. This cook book is full of beautiful recipes along with cute little love stories that will make date nights at home such a fun experience! 2. Sugar Lip Balms by Fresh – These lip balms are some of my favorites. Not only do they have the most beautiful colors but they have SPF in them which is such a win! They are not a lipstick but more of a tinted lip balm which is perfect for everyday wear. Sephora sells them separately or you can buy them in cute little combos (like this one) if you wanted to try more than one color. 3. Raise a Glass Water Bottle by Kate Spade – I recently started carrying one of these glass water bottles everywhere and found myself drinking SO much more water everyday. I really couldn’t believe it. This one by Kate Spade is just SO cute. It makes such a great gift, helps you drink more water, helps eliminate plastic and is good for you! That’s too much good! I also LOVE these heart glass water bottles by BKR. Talk about perfect for Valentine’s Day! 4. Pizza Sweatshirt – Ok, now this is darling! Who doesn’t love pizza?!? This sweatshirt by Ily Couture is just perfect for those “galentines” in your life who you’ve shared one to many secrets with while drinking wine and eating pizza. Or if pizza is your one true love, who never lets you down, this sweatshirt is for you. It’s ok to give yourself a gift on Valentine’s Day. You deserve it. 5. Stemless Wine Glasses – My husband LOVES stemless wine glasses. He feels as if he won’t spill “as much” if he is drinking wine out of a stemless glass. To each their own. These ones by Kate Spade are a super fun gift for couple in your life or for a spouse. They would also look really cute on a bar cart. 6. A Cute Phone Case – Every girl loves getting a new phone case, especially one that says “I am Fun”. Ban.do is always my go-to for some of the most outrageous and amusing phone cases. I mean, how fun is this one, this one, and this one. 8. Getaway Heart Duffle Bag – Let’s face it. Every girl needs an over night bag of some sort. Whether it’s for bringing a change of clothes somewhere, for the gym or to actually go on an overnight trip, a super cute duffle bag is NEEDED. And how amazing is this red heart one by Ban.do?! 9. Gilded Arrow Ring – I LOVE this simple yet adorable ring! It’s perfect for everyday wear and goes perfectly with the arrow necklace. I also love how it’s easily adjustable to fit any finger. Arrows are just so perfect for Valentine’s Day! 10. Home Pilow – I’m loving all of the pretty pillow covers that are at Pottery Barn, especially this adorable HOME one. If you have never bought a pillow at Pottery Barn, it’s the BEST thing ever. You literally buy one pillow and then with every season or holiday buy a different slip cover for the same pillow and just switch it out. It gives your decor a refreshed and different look with every season without having to buy a whole new pillow or store a pillow you don’t want out. It’s genius! Hopefully this post helps you find some great gifts for friends or even for yourself! Happy LOVE month!